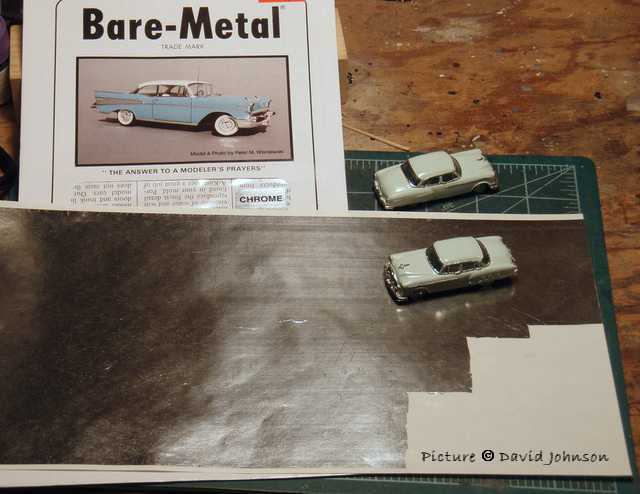 I have been using Bare-Metal Foil for chrome since I started modeling 1/87th scale automobiles about 20 years ago. My standard application has been to use it for the bumpers and the grille where possible, using silver paint for smaller trim. My tools include a magnifying lamp, a fresh stainless steel X-Acto blade, flat tooth picks and tweezers with a sharp point for picking edges. 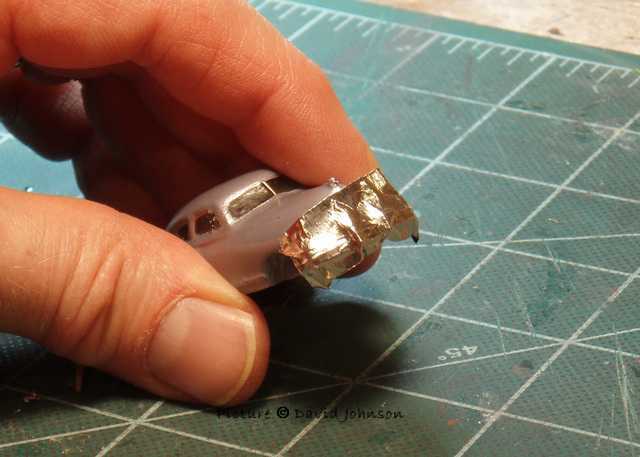 Before applying any foil it is important to remove imperfections from the casting. The reflective foil will make the dimples and divots more visible. 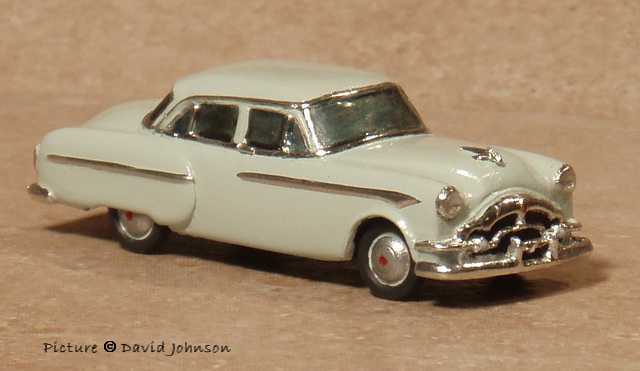 The model here is a Greg's Garage 1949 Packard. 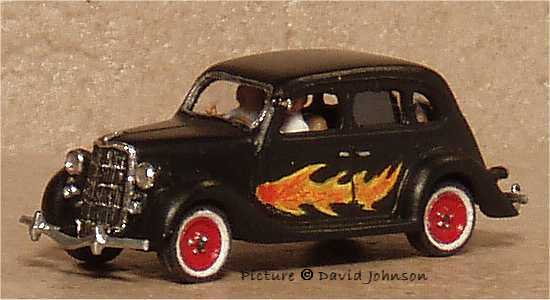 Usually I do the grille as a separate piece, however on this casting the grille and bumper run together. An oversized piece of foil has been pressed lightly over the bumper and grille. The hardest area to stretch the foil over will be those over-ride protection bars on the bumper. I started the burnishing at the center of the bumper then worked toward both ends. This allows the loosely bonded foil to pull in over the over-ride bars. Even so, the foil nearly always breaks near the top of the bars. 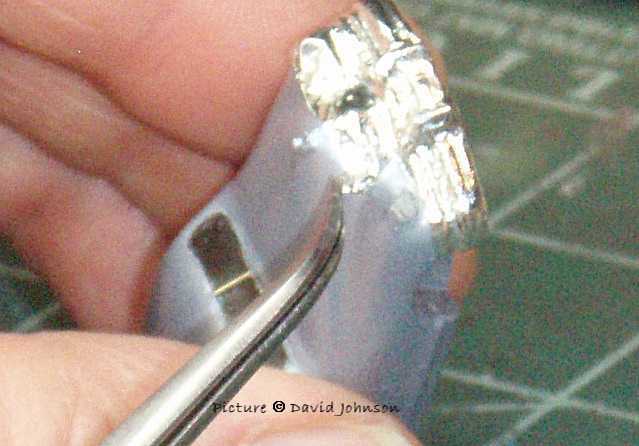 Here I am making button hole slits at the top of the bars to encourage the foil to break where I want it to. If the foil breaks anyway, I touch up with chrome silver paint. The next photo shows burnishing moving upwards onto the center of the grille. 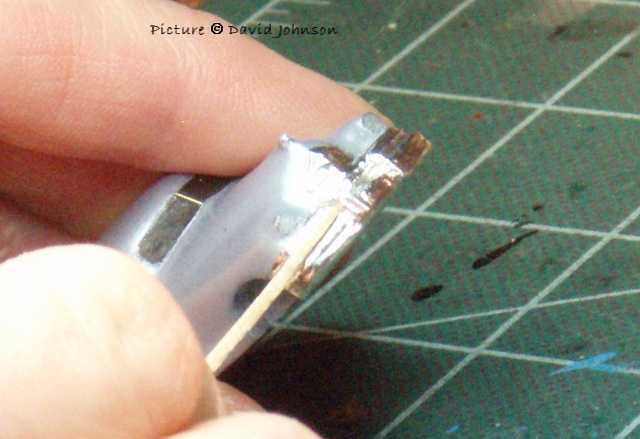 The small end of the toothpick is used to press the foil into contours and tiny corners. I pull the toothpick along the foil, and generally avoid pushing it. Now the foil is completely burnished. The burnished area extends slightly beyond where the cut edges will be. Leaving a loose corner makes the peeling easier. Trimming a complex shape like the grille takes several connected cut lines to trace the edge. The magnifying lense makes this job much more precise and manageable. After trimming I use the tweezers to pick edges and remove the foil. 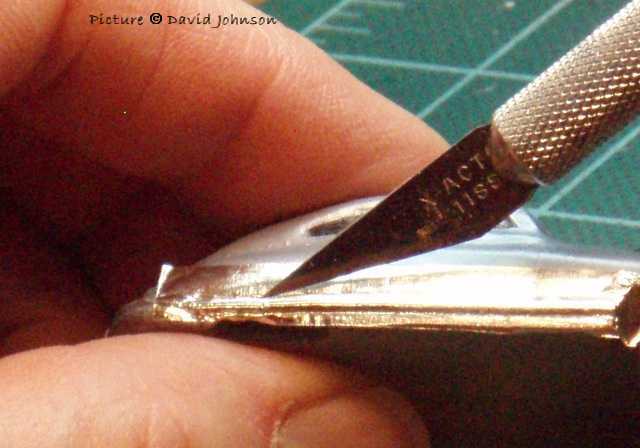 The cutting process tends to lift the foil, so I burnish the edges again and inspect for other areas needing additional burnishing. Here I am using the flat side of the toothpick and sliding it along a groove between grille bars. 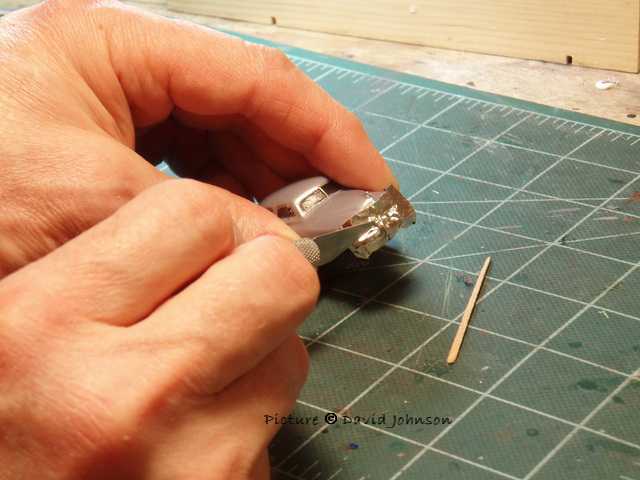 The last step is to trim the foil on the bottom and burnish its edges. 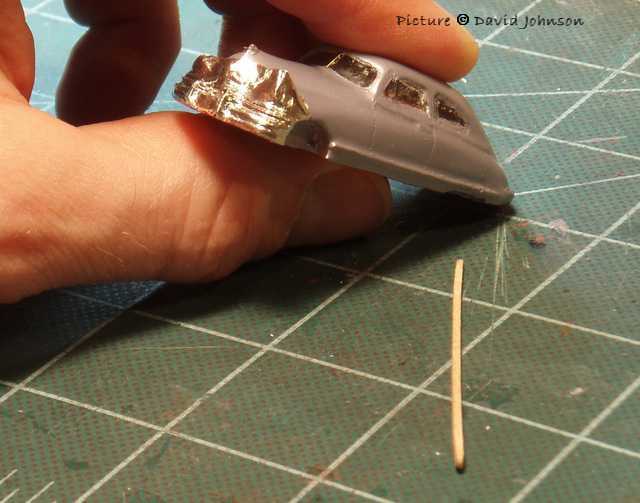 Even with a fair amount of handling I have never lost the BMF from the bumper of a finished model. In fact, I handle my models by the bumpers whenever possible because the BMF has been more durable than silver painted trim. 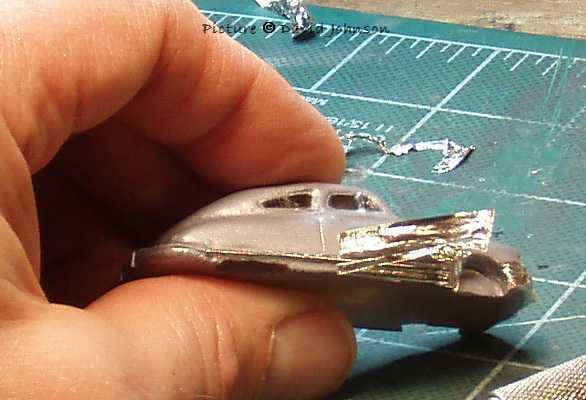 If the casting has well defined side trim I have found it easy to apply foil. Again the magnifying lense makes this practical. Where the chrome trim meets the sheet metal there is an inside angle. Imagine it as a V-groove and hold the knife blade perpendicular to the bottom of the groove. In the previous photo the scraps of foil on the cutting matte are mistakes. It took four tries to get the grille. Minor imperfections can be touched up. 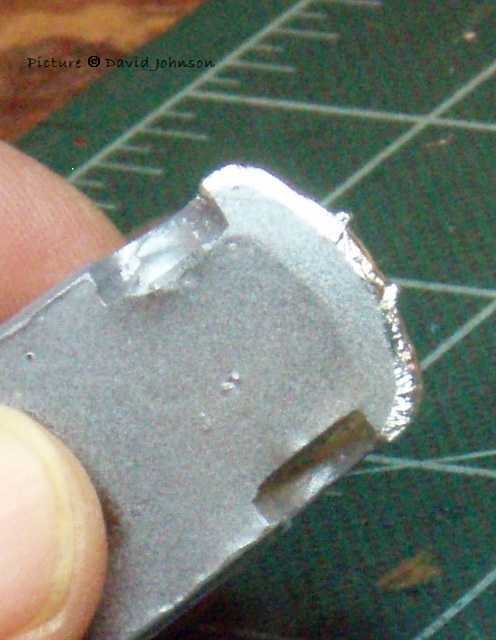 For example if the side trim is too wide, I slice off an extremely narrow sliver. Stray cut marks on the body are touched up with body color paint. Nicks in the foil sometimes can be burnished back down and secured with a gloss clear coat. Other small nicks, tears, and shortages in the foil are touched up with silver paint. 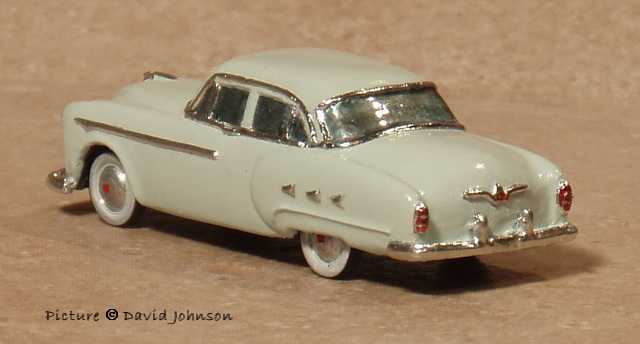 On this pair of 52/53 Packards from Cutter's BMF was used for all chrome except the wheels. 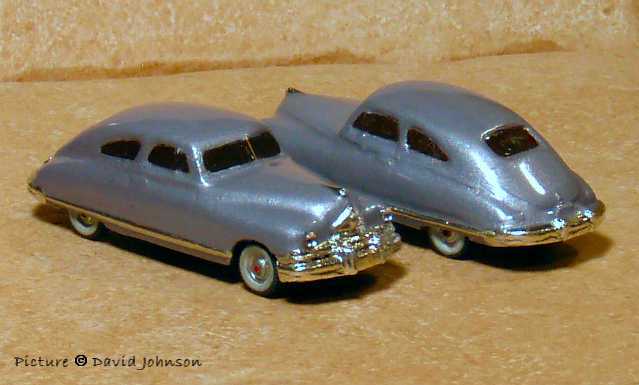 The foil missing from the BMF sheet pictured above was used for this pair of models. From prototype photos I decided that the space between the grille and bumper should be dull, so I painted it silver prior to applying BMF. The grille was done as a separate piece. As the contours are very deep, I made slits in the openings before pressing the foil all the way in. Flat black paint was brushed over the foil in spaces between the grille members. 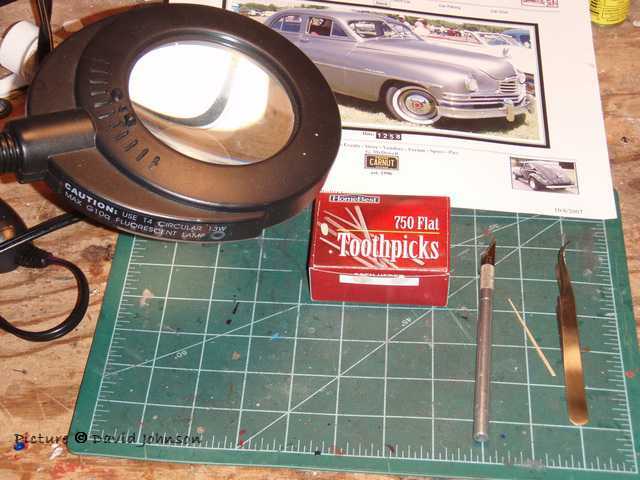 Headlights are difficult because castings generally do not have defined edges to guide the knife, and because the foil wants to pop off. The lights of both of these models were first drilled to a shallow depression. A small square of BMF was burnished over the area. Rather than using the knife point to cut the foil as usual, the blade edge was pressed onto the foil and the knife and model were rotated to cut the perimeter of the rim. About three such cuts were combined to make it all the way around. 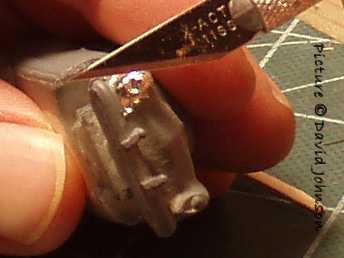 Micro Kristal Klear was used to form the lense, then sealed with Modelmaster Acryl clear gloss. 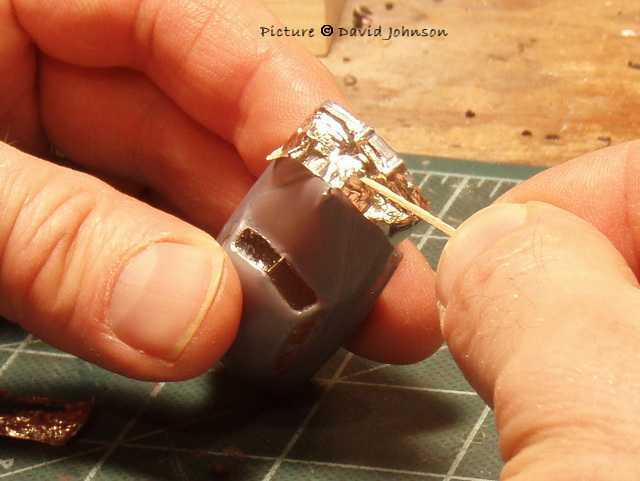 I also sealed the edges of the foil, as the foil had a nasty habit of popping off later in the modeling process. Usually headlights needed more than one try to get right, and touch up was done later with body color and silver paints. The windows and surrounding trim were completely covered with BMF then painted; another trick learned from Chester. A total of four pieces were used, covering windshield, rear window, and each side. I chose to trim the outside edges as each piece was applied. Next I painted the glass using multiple coats of tinted Acryl clear (There is an existing thread on "What color for the glass" on the messageboard, and I will post more info there). I tried to keep the paint off the chrome, and was able to scrape clean the few areas where it strayed over the chrome. After the paint dried, I cut the foil away to expose the body colored B-pillar and door headers. The rain gutter is very narrow, so I sealed it with Acryl clear. ( An alternate method would have been to paint the body color over the foil in this area.) Silver paint was used to compete the outline of the vent pane windows at the A-pillar and C-pillar. The tailights were foiled, then the lenses were painted with Testors Ruby Red enamel. It is semi-transparent, and the darker color is what I remember seeing on older cars. After it had dried for a couple hours I used a scribing tool to scape away paint to create fine horizontal lines. We will fast forward and the Packard is joined by a twin. Both have received wheels, a brush painted coat of Future floor wax to make the body color shine, and MV Products lenses for headlights. All remaining details will be painted. At last, the completed models. The foil has been painted over in black and body color to define the grille details. BMF chrome takes considerably more time than brush painting chrome silver. I very much enjoyed working with Jerry's sculptures ,and there came a point where there was already so much foil chrome that I decided to foil all of the chrome on this pair. Most of my models will continue to combine foil and silver paint, and I still have in mind to try Alclad when the time comes to cover some huge bumper bullets. I hope this has been helpful for others toward sucessful use of BMF.